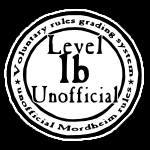 The rules grading system has been introduced by Christian Templin in his article "Maintaining Law & Order", published in the Letters of the Damned Mordheim Ezine issue 3 (read here). 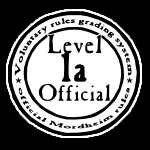 Level 1a - Official: Official Games Workshop rules. Level 1b - Unofficial: Released through Games Workshop* but not declared to be official part of the rules. However, the quality is totally professional. 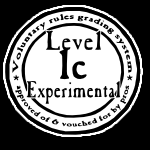 Level 1c - Experimental: Not released by Games Workshop, but approved of and vouched for by professional rules designers (designers who have created level 1a and/or 1b rules). 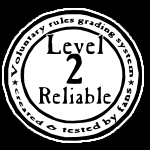 Level 2 - Reliable: Created and thoroughly tested by fans. *when speaking of Mordheim this includes the following forms of publication: White Dwarf, Town Cryer and Fanatic Magazine. Fanatic Online does not count. 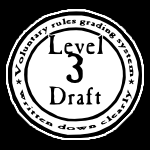 If you want to use the grading system, simply read the article and put an adequate note to your rules that indicates their level. You can also download the level images and use them for your website or files.